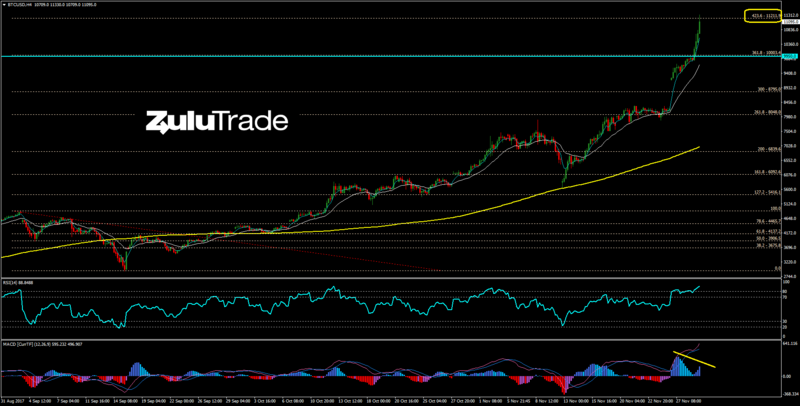 Bitcoin just reached $11210, the 423.6% Fibo extension level! Bitcoin is ripping to the upside. Buyers are in so hot momentum that pushing the king of cryptos in a parabolic move. It is currently testing the 423.6% Fibonacci extension level. In the meantime, there is not an RSI bearish divergence. MACD histogram is giving a negative divergence but any thought for shorting BTCUSD is risky. Every valid breakout of resistance is a potential buying opportunity. This strategy is by far the most profitable approach.